04:20:00 Makes 12 servings, 1/2 cup (125 mL) each. We've given a classic Italian dessert a Canadian twist! The addition of maple syrup and maple sugar gives this tiramisu recipe an unexpected flavour boost - our Maple Tiramisu is delectably delicious and oh-so-easy! Add milk to dry pudding mix in large bowl. Beat with wire whisk 2 min. or until well blended. Refrigerate 5 min. or until thickened. Meanwhile, beat cream cheese and 1/4 cup of the syrup until well blended. Add to pudding; beat until well blended. Stir in whipped topping. Dissolve coffee granules in warm water in shallow dish; stir in remaining 3/4 cup syrup. Add ladyfingers; turn to evenly soak both sides of each ladyfinger. Line bottom and side of trifle dish with 10 of the ladyfingers. Spoon half of the pudding mixture into prepared dish; top with remaining 8 ladyfingers, torn into bite-size pieces. Drizzle with any remaining syrup mixture; cover with remaining pudding mixture. Refrigerate at least 4 hours. Sprinkle with maple sugar just before serving. Store leftovers in refrigerator. 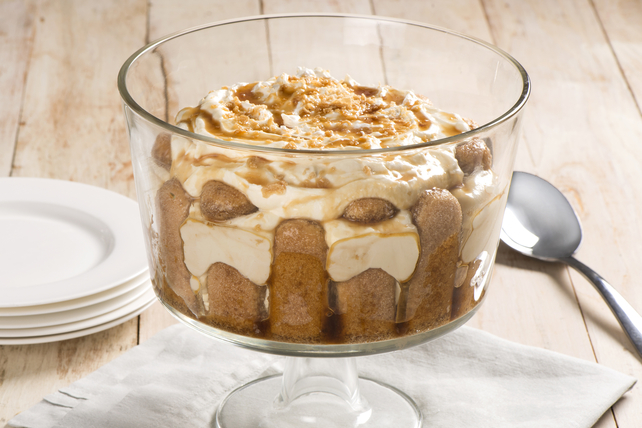 If you don't have a trifle dish, use a 2-L clear glass bowl or square glass baking dish instead. Good news!! You'll save 50 calories, 4 grams total fat including 2.5 grams saturated fat per serving by substituting skim milk, Jell-O Vanilla Fat Free Instant Pudding, Philadelphia Light Brick Cream Cheese Spread and Cool Whip Light Whippped Topping. Serving Size Makes 12 servings, 1/2 cup (125 mL) each.